In Paris, check out the Mme Vionnet exhibit and the upcoming tribute to Animal print and motifs at Les Arts Decoratifs (Museum of Decorative Arts). Also in the City of Lights, pay homage to the great Yves St. Laurent at the Petit Palais. In New York, admire "American Beauty" at the Museum at FIT. This exhibit explores the "philosophy of beauty" and how it applies to the craft of dressmaking by American fashion designers. Also at the museum, check out "Scandals, Sandals & Lady Slippers" for all the foot fetishists out there. Over at the Cooper Hewitt Museum, the work of the Mulleavy sisters is on display in a retrospective of the Rodarte Label. 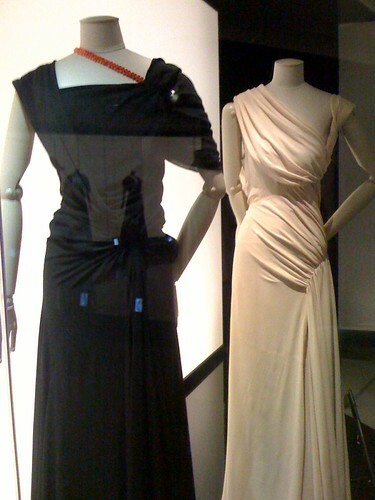 In London, look for Grace Kelly: Style Icon at the Victoria and Albert Museum. After admiring the past, look ahead to Future Fashion Now, an exhibit of the graduating designers of the Royal College of Art. At the Fashion and Textile Museum, relive London's cultural revolution with the Foale & Tuffin: Made in England exhibit.